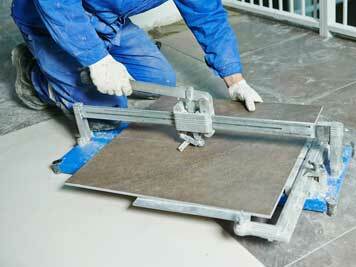 Why Consider Getting Tile Installed? There are various reasons to consider adding tile into your home, either as a smaller addition like a backsplash, or something more expansive such as the walls. It’s very versatile thanks to the variety of types, so whatever look in particular that you want for your home, from modern to rustic, there’s bound to be something that suits it. It’s also hypoallergenic should anyone in the home have troubles with allergies. Aside from looks, it also boasts a lot of positives such as being waterproof, easy to clean up, much stronger and longer lasting than a lot of other materials, and generally just very easy to maintain. The best type of tile for you and your home depends mostly on what you’re looking for overall. Should you want something that’s fairly cheap, ceramic is the best way to go and is the most common for that reason. Glass is a good pick for those who want a large array of colors and looks to choose from and who don’t mind taking extra care with it. Glazed porcelain is ideal if you want something that doesn’t grow bacteria or mold easily and is overall very strong. Should price not be an issue, natural stone is an amazing addition to any room. Marble and granite can have lovely patterns, and the bold colors overall can really set the tone of the area. Our team will set to work first by cleaning the area the tile will go on, that way the adhesive is sure to stick properly and last. It’s also important to find and tend to any dents or other such issues to avoid unevenness with the tile layout. Once the pattern is determined, we’ll begin attaching the pieces with the adhesive and use a special spacer tool to keep them completely even. After they dry, grout is applied. Call Drywall Repair & Remodeling Hollywood now and let us take care of all your tile needs.